Machine Matzos: Timing is Everything! 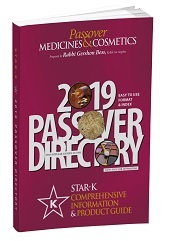 Clarification: Pesach Guides including Star-K/Rabbi Bess Lists, indicate that NatureMade Melatonin is chometz free. Please note that this refers only to NatureMade Melatonin Swallow Tablets. Naturemade also makes a product called “VitaMelts Sleep” made with melatonin. The VitaMelts Sleep contains chometz and should not be used on Pesach.